Elgin Watch Company was a grand endeavor from the moment it was conceived in 1864. Smoke from the Civil War had not yet cleared and businessmen were already being lured from Massachusetts' Waltham Watch Company to organize and build a monumental watch factory in Elgin, Ill. By 1865 the company was organized and capitalized with half a million dollars, and unimaginable post-war sum. The company's leaders thrust themselves into the industrial revolution and were, in a few short years, running the biggest pocket watch company in the world. By the middle of the 20th Century they also dominated the wristwatch world, producing, among other popular models the "Lord and Lady Elgin" series distinguished by high-grade movements and progressive case designs. We are elated to offer this Elgin National Watch Company timepiece, circa 1904, containing one of the highest grade railroad-grade mechanisms produced: a solid nickel, ruby jeweled, 3/4 plate 23 ruby jeweled movement housed in a fine white-tone case. First, a bit about the movement of this watch. An ultra high-grade 23 jewel Veritas is one of the highest grade movements produced by Elgin — and one of the most desirable. 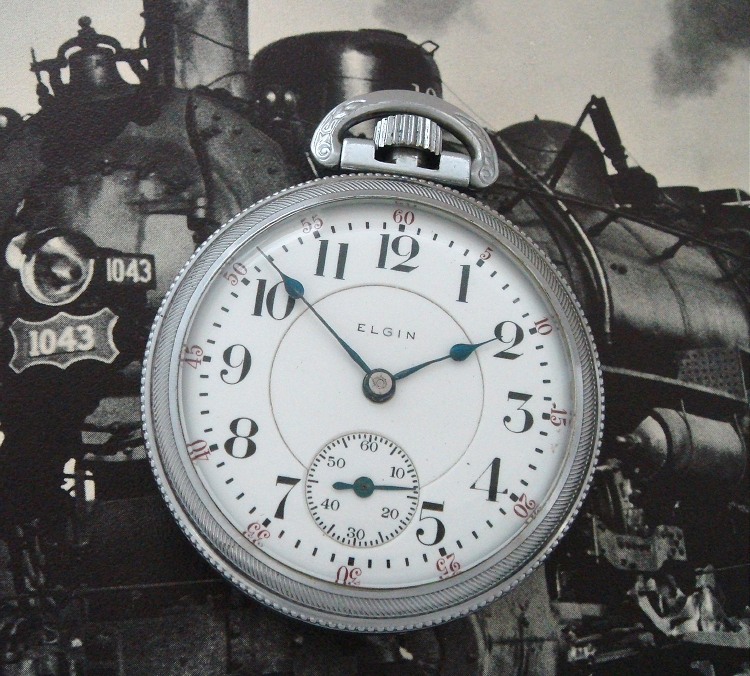 First of the 23 jewel 18 size railroad watches by Elgin; first Elgin 18 size with a jeweled motor barrel, this ultimate pocket watch Features no less than solid gold jewel settings in solid nickel plates, a solid gold train and a jeweled motor barrel. This movement would have been carried by someone who could afford the finer things in life — business owner, railroad executive — someone who would have known the value of a fine timepiece. Higher grade and more complicated than a standard pocket watch movement, these mechanisms were snapped up by the "better heeled" Victorian clients to be used accurate timekeeping and whipping up envy among friends and associates. This example is bright and clean, quite frankly, a work of mechanical art. Please take a few moments to enjoy the expanded images of the watch, as it is a genuine piece of horological history. Movements of this caliber were almost always fitted into equally fine cases. In a fitting complement to this "Veritas" grade movement, this heavy white-tone classic is in good original condition.